Tow Pac InstaTrike an alternative to a convensional trike conversion. As featured on our Bikes Page in 2007 when my friend Lou came to me and asked about this product I had no idea what to expect. Well the results were great. We have since installed several Insta-Trike kits on a variety of motorcycles and have tried similar products from other manufactures but none have compared to the quality and reliability of the TowPac InstaTrike. Although we decided not to become a TowPac’s registered dealer we do support their product. Our motivation is not profiting from the sale of the InstaTrike kit. We are motivated by getting riders back in the wind. Bikes Built Better prides itself on helping customers with various disabilities or limitations get back in the saddle again. We can order your Insta Trike or you can order it yourself have it delivered here and we will install it for you. You may also want to take advantage of some lighting upgrades we can provide for you which are very important for increased visibility. We can also make many other modifications for your riding needs such as electric shift, auto clutch, foot and hand control modifications whatever you need. Pictured to the right is the 2001 Electra Glide Lou had converted in 2007. This gave him the ability to ride again after a motorcycle accident that permanently damaged his leg and has made Lou very happy. He now has over 25,000 miles on his Insta Trike. This one was purchased before the 12 inch wheel option was available from TowPac. Harley Davidson Sportster XL883 with TowPac's InstaTrike Deluxe 12 inch Aluminum wheels and extra lighting installed here at Bikes Built Better We now prefer the 12 inch wheel Insta Trike Kits over the 8 inch for a more substantial look and feel. The Insta Trike fenders have a mounting location that will handle a variety of light configurations. The kit comes with reflective tape but we highly recommend lights for more visibility. 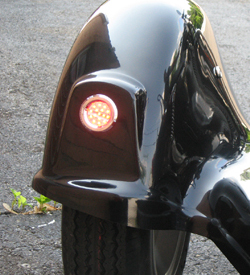 These are LED run brake turn combination lights by Cycle Visions very bright and a great add on feature for the Insta-Trike Some have preferred the classic tomb stone or HD tail light style instead. What advantages does InstaTrike offer over other trike systems? Priced thousands less, InstaTrike offers all of the advantages and stability of a conventional trike while completely conserving your motorcycle and giving a smooth stable ride. Product spotlight of the Tow Pac InstaTrike an alternative to a convensional trike conversion. 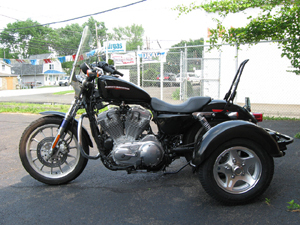 InstaTrike offers all of the advantages and stability of a conventional trike while conserving your stock motorcycle and giving a smooth stable ride when needed.